The Inner Mongolia Autonomous Region is landlocked between Russia and Mongolia at an altitude of about 1000 metres. The vast region of Inner Mongolia has dense forests, expansive grasslands, and a plethora of animal and plant species. It is also desolate—some areas are without trees for miles, and the vast expanse of the Gobi Desert also covers much of the territory. Inner Mongolia produces more cattle, wool, camel hair and cashmere than any other region. It is rich in potatoes, flax, sugar beets and wheat, and famous for plump mushrooms, sweet melons and nutty black sun flower seeds. It also has China’s second highest coal output. Much of the population of Inner Mongolia live on the wide steppes, in traditional tents called yurts. Numerous temples and tombs are scattered throughout the region, such as the mausoleum of Genghis Khan, in the city of Ordos. 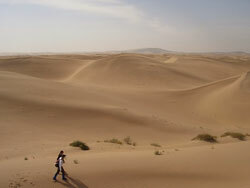 Xiangshawan in the Gobi Desert offers sand sledding and camel rides to the numerous visitors that trek out to the area.